Happy Friday! I couldn’t be more excited for another weekend. Was it just me, or did the Thanksgiving weekend blow by way too fast? Just me? Oh. Well, I still have a lot to catch up on, this blog for one is at the top of my list. Anyways, you may remember my new hair style that SEVEN the salon hooked me up with a couple of weeks ago. Today, I’m sharing a few tips and tricks that my stylist, Maritza, shared with me while I was getting my hair did. I’m also sharing a few of the SEVEN Luxury Haircare products they sent me home with, as well as a super easy 30 second hair style to put your holiday look together once you’ve curled your hair! How are you planning to wear your hair this holiday season? I always need hair tips, girlfriend. It’s great the stylist gave you tips and tricks. I know a few people that have gotten an amazing cut / style and then left with “well, how do I recreate this?” Thanks for sharing! Aw, thank you so much Yaitza! Your hair looks beautiful! The tutorial makes me miss my long hair. I can’t wait for it to grow back out. I have super short hair so there is not much I can do it to make it more holiday-ish, except maybe put a bow in it! Ha! I’m sure that would be adorable though! 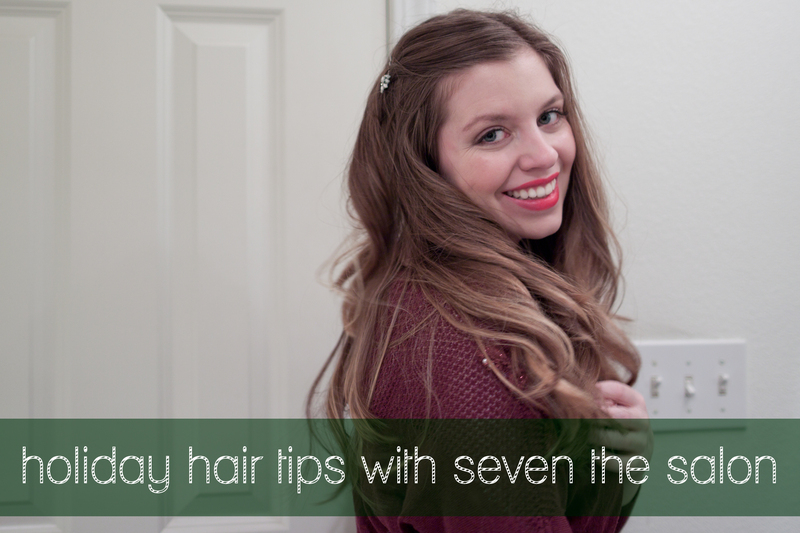 Easy and quick hair tips are ALWAYS welcome! I don’t have the skill or patience to do something crazy. That was perfect… thanks! Glad you enjoyed – I’m often the same way! Great tips. Your hair looks beautiful. Thank’s for the tips, I will definitely have to use some of these this holiday season! great video! I love it!! Love the fullness — so pretty! I go to Seven as well, they are the best! Their products are amazing too, I definitely hope I win!